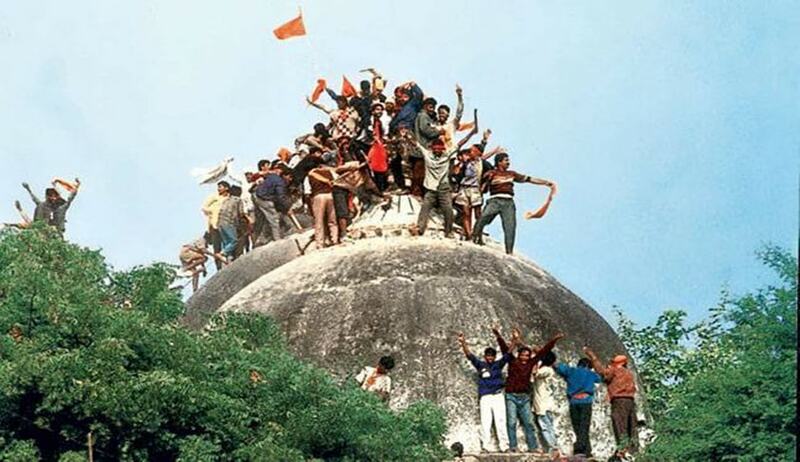 Comparing the demolition of the Babri Masjid with the tearing down of the Bamiyan statues in Afghanistan by the Taliban, Senior Advocate Rajeev Dhavan commented, “What happened in 1992 can be called an act of the Hindu Taliban...it could not have been done, it should not have been done....no equities lie”. In the course of the hearing in the Ram Janmabhumi-Babri Masjid dispute before the Supreme Court on Friday, the Shia Central Board of Waqf, UP, agreed to surrender its stake in the disputed land in the interest of the “integrity of the country”. The attention of the bench of Chief Justice Dipak Misra and Justices Ashok Bhushan and Abdul Nazeer was drawn to the observation by Allahabad High Court Justice Sudhir Agarwal in the impugned verdict of 2010, in respect of the 1946 judgment delivered by Civil Judge, Faizabad declaring the Babri Masjid to be a Sunni Waqf. “The waqf created by a Shia Waqif would be a Shia Waqf and could not be a Sunni Waqf. Admittedly, as per their case, the mosque was built by Mir Baqi who was a Shia and that he being a Waqif his heirs were the Mutwallis one after the other, but the Shia Central Board of Waqfs U.P. did not agitate the case any further either because of negligence or collusion in those difficult days of communal conflict immediately before the partition”, Justice Agarwal had noted. Senior Counsel Rajiv Dhavan, appearing for the Sunni Waqf Board, advanced that there was no need to respond to the argument, as an appeal had been filed against the 1946 judgment and was pending before the apex court. On behalf of the Shia Waqf Board, it was also contended that ‘religion’ is not defined anywhere in Islam, that the Supreme Court in Ismail Farooqui (1994) has not held ‘namaz’ as an essential and integral part of Islam, and accordingly, its reconsideration by a constitution bench was not necessary. It may be noted that on previous occasions, Dr. Dhavan has pressed for a reference to a larger of the 1994 judgment in as much as it was observed therein that the mosque is not an essential part of the religion of Islam and that the ‘namaz’ may be offered even in the open. “That is the question I want Your Lordships to settle- whether the offering of prayer is the essential practice or its offering in a mosque”, replied Dr. Dhavan. “After 70 years, with Your Lordships’ fortification, this country has seen religious equality...no faith has the right to destroy a mosque...and even after it had been destroyed, to argue in Lucknow that it could not be re-built and that nothing could be done? The destruction of the mosque does not conclude the question of prayer!”, urged the Senior Advocate. Comparing the demolition of the Babri Masjid with the tearing down of the Bamiyan statues in Afghanistan by the Taliban, he commented, “What happened in 1992 can be called an act of the Hindu Taliban...it could not have been done, it should not have been done....no equities lie”. “We accept Ismail Farooqui in so far as it says there was no acquisition (of the disputed property) and in as much as the Central government was appointed the statutory receiver...when was the occasion for us to raise alarm? When the Allahabad High Court relied on Ismail Farooqui to say that the mosque is not an essential part of Islam and to discuss the ‘particular significance’ and ‘comparative’ significance’ of places of worship. This was not called for...on the very first day (December 5, 2017), when the pleadings were being exchanged, we had raised the question. I had even insisted on a later date that since the validity of polygamy has been referred to a Constitution bench, this issue should be too...”, he justified. “Article 25 requires a detailed examination by the court of what is an essential part of the religion, as was carried out in Tilkayat [Tilkayat Shri Govindlalji Maharaj v. State of Rajasthan (1963), in respect of the Nathdwara temple of Rajasthan]...”, he continued. He also objected to the observation of the Allahabad High Court that the right of the Hindus to worship at the Rama Janma Bhumi, continuing since times immemorial as an integral part of their religious right and faith was sanctified by judicial orders from 1949 (inter alia restraining the removal of the idols of hindu deities or interfering in their worship at the disputed structure) and that This right has concretised and accordingly, has to be protected. “How can this comment be made and hoisted on the question of particular significance? This infiltrated the questions of limitation and equities”, argued Dr. Dhavan. Dr. Dhavan, on Friday, indicated the order dated January 27, 1993 of the Supreme Court five judge bench in connection with the Presidential Reference for opinion on the existence of a Hindu religious structure on the disputed site in Ayodhya- Although the bench, in Ismail Farooqui, eventually declined to answer the reference, public notice to all interested parties was issued, besides individual notices to the Union of India, the state of Uttar Pradesh, the Advocates General of all states as well as the parties to the suits ultimately adjudicated by the Allahabad High Court in the impugned judgment. While Mr. Parasaran had earlier appreciated how even in a Presidential Reference, where there is no right of audience, notices were issued to all interested, Dr. Dhavan drew the attention of the bench to the remark in the order that “no party will have a right of audience unless the Court specifically allows the same”. He also referred to another order of the Supreme Court of September 24, 1993, by virtue of which it had transferred from the Allahabad High Court to itself certain writ petitions challenging the constitutionality of the Acquisition of Certain Areas at Ayodhya Act of 1993, the statute having resulted in the abatement of the original suits. Emphasising that the apex court had stayed the hearing before the High Court on the issue as to whether the suits had abated or survived, Dr. Dhavan submitted, “No suit was transferred...this is the foundation of Mr. Parasaran’s argument that the suits were here and adjudicated”. It may be noted that, in May, Mr. Parasaran had cited several authorities to buttress his submission that the Doctrine of Representation precludes from resuscitation interests which were represented in a judgment tendered earlier. In the light of the appellants seeking a reconsideration of Ismail Farooqui by a larger bench, He had taken recourse to the principle of res judicata enunciated in section 11 of the CPC and particularly, its Explanation VI. “What was ‘directly and substantially in issue’ there was the validity of the Act (of 1993)...is it the same party agitating the same issue? The answer is decisively ‘no’! Are the parties the same? The suit parties were not there!”, argued Dr. Dhavan. Quoting from Sajjadanashin Sayed v. Musa Dadabhai Ummer (2000), he sought to submit that in spite of an issue and a decision in an earlier case, the finding may be treated as being only collaterally or incidentally in issue and not res judicata. “Was it necessary to decide, in connection with the question of acquisition, whether the mosque is essential to Islam?”, Dr. Dhavan attempted to hammer in the point. Further, he countered Mr. Parasaran’s reliance on Gulabchand (1964), indicating that the precedent envisages the bar of res judicata only in respect of questions which are decided after “full contest”. “There was no contest”, he contended. Finally, Dr. Dhavan invited the bench to peruse Satyendra Kumar v. Raj Nath Dubey (2016) to submit that where the decision is on a pure question of law, then a Court cannot be precluded from deciding such question differently.